I have to confess... I absolutely LOVE the sitcom show The Office. I don't know exactly what it is about it, but the humor is so unique and outrageous at the same time. I just makes me laugh. No doubt, my favorite character is Dwight Schrute played by Rainn Wilson. His personality exaggerates (well not really by that much!) people I come across everyday. My wife loves this character so much in fact that she asked me to get her a Dwight Bobblehead for her birthday last year. So I did! I have no idea why... but every time I look at this thing, it makes me laugh! 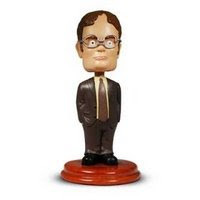 I think everyone needs a Dwight Bobblehead! It's a constant reminder that the world is filled with gullible yet passionate people that if you look at the situations at the right angle... they're quite funny!